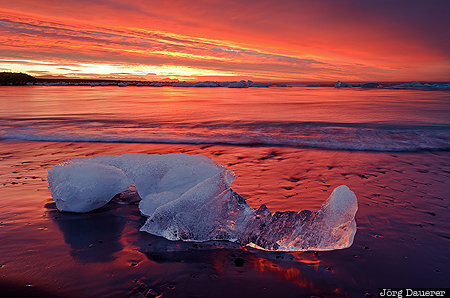 A colorful sunrise above the lava beach at Jökulsárlón glacial lake with a small back-lit iceberg in the foreground. Jökulsárlón glacial lake is in Austurland in southern Iceland. This photo was taken in the morning of a rainy day in September of 2013. This photo is part of the exhibition Colorful Sunrise (October 2013). This photo is in the Photo Calendar "Iceland". This photo was taken with a digital camera.